14-Sep-2015 -- This is the third out of 4 reports reaching confluence points during a bicycle trip through Southern Spain. The story starts at 37°N 4°W and continues from 37°N 3°W. I started riding from the town El Ejido in the morning at 7 AM. I had to cover 40 km until I reached Almeria, where I had Moroccan breakfast at the promenade. In the evening I had scheduled my return flight from Alicante to Zürich. The distance from Almeria to Alicante is more than 250 km. This was timewise too tight to make it by bicycle. Taking the train was out of question because it runs via Madrid and therefore needs all day. So I rented a car at Almeria Airport in order to return it at the Airport Elx-Alicante. With my bicycle in the trunk, I had an unspectacular drive. The navigation system guided me to the confluence point. Only the last 400 m were on an unsealed muddy track. I parked just 30 m from the confluence, which is on wasteland in front of a single house. The area must have been under water recently, as I could tell from the mud. Dog tracks reminded me that the owners could be suspicious of my photo-documentation. But when the woman came out of the house, she only asked friendly if I was alright. When I affirmed, she continued to do her business and I continued mine. In about one kilometre distance is the tiny little village El Argamason. 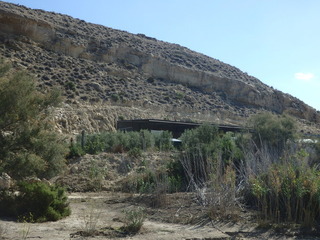 Right after the visit, I continued driving towards Alicante, but another confluence point was in my way. The story finishes at 38°N 1°W.